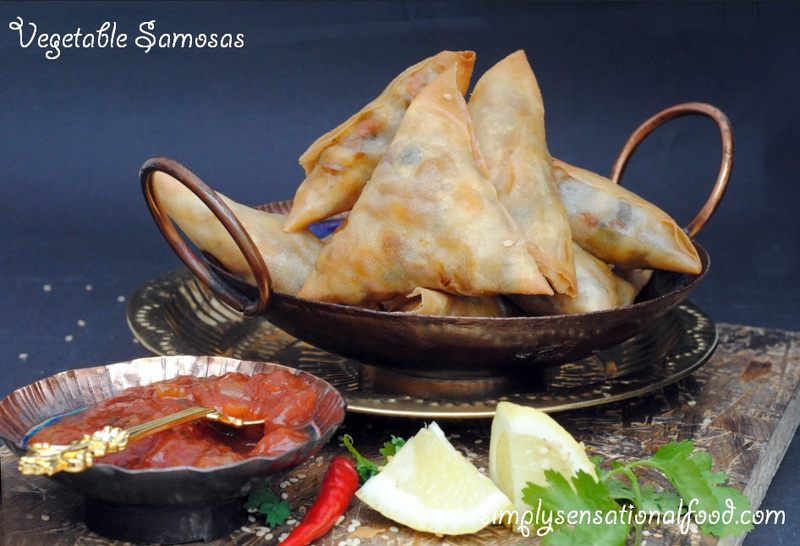 Samosas are a traditional Indian snack, that are very popular in all Indian households. They are delicious pastry parcels usually filled with a spicy vegetable filling and deep fried until golden brown and crispy. 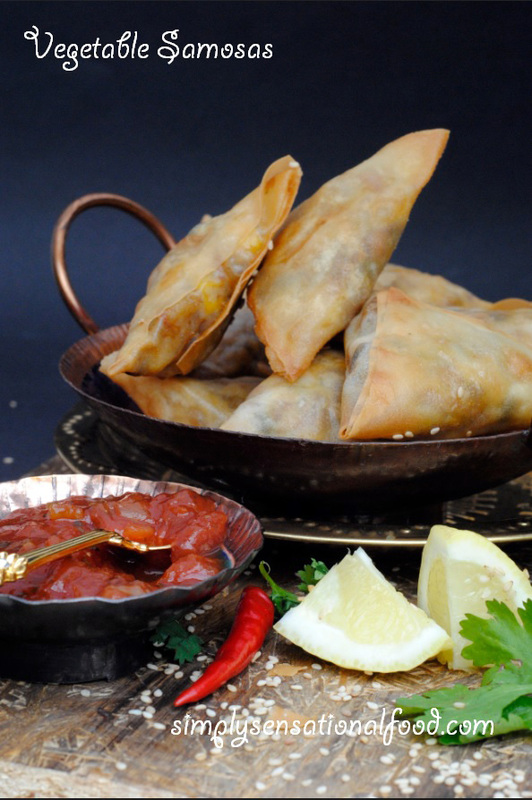 Samosas are commonly served with tangy tamarind chutney and green coriander chutney. Samosas sizes and their fillings differ from state to state of India. Where as in the state of Gujarat samosas are dainty little pastry triangle filled with peas and potatoes,carrots they will differ in the state of Punjab where the Punjabi samosas are larger and primarily filled with a potato filling only. In other states cabbage, paneer-Indian cheese, fried fruits and nuts and also lentils are used as a filling too. There is a very precise art in folding the samosas which although can be tricky is not too hard to master as practice makes perfect. I remember as a child my mum and aunts used to fold some 300 samosas for our family gatherings It was almost like a production line.Samosas are also commonly sold by street vendors and its a favorite street food for all Indians. This month I created a step by step pictorial on how to make the perfect samosas. You can read all about my samosa recipe at the Foodies 100 site where I have written a guest post all about making these delicious samosas. You can read the recipe for my Gujarati Style vegetable samosa here. Please do drop by the Foodies 100 website to check out the easy recipe with step by steps pictorial instructions. Lets cook for Dad event by simplyfood. looks good. I always grab something like this when hungry on the go. I love samosas and I think I'm right in thinking they'd be dairy free? If you weren't using paneer, obviously. These look lovely - I'm finally getting over my aversion to deep frying, so I'll have to put these on my list! I adore veggie samosas, thanks for sharing the step by step, I can have a go at my own now. Such great photos! I just want to reach into my screen and take a bite! I love samosas, but I haven;t made my own before. They do look really simple to make though. My favourite snack.. can eat few of these .. so irresistible ! I would love to know how to make samosas so I will pop over to have a look. Wow-these look amazing! 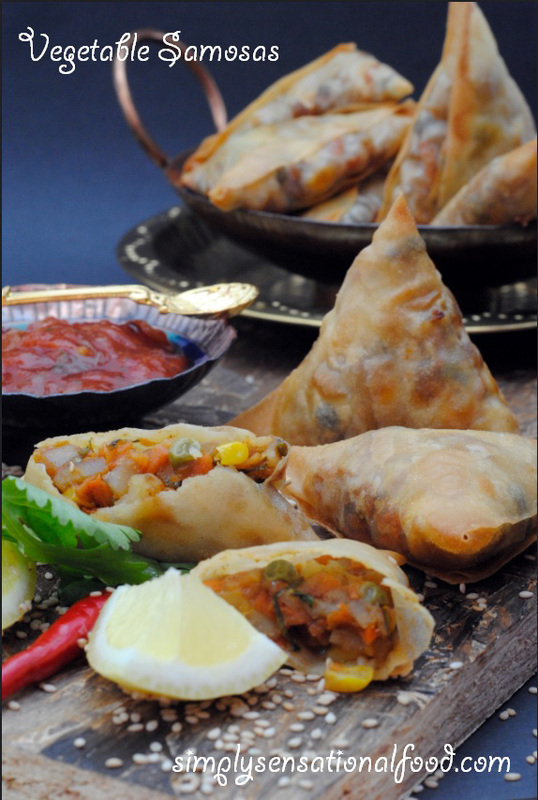 I could do with one of them right now x.
I love samosas, but have never made them before - these look delicious! I love samosas. Perfect picnic food. They look lovely! I've never made samosas myself but I might give it a try now! I love samosas, your photos look sensational too! These look and sound absolutely fantastic. Wish I could eat some right now! Oh gosh these look amazing. I love a samosa....yum!! My husband loves samosas, I bet he'd enjoy some homemade ones.